Excessive Thirst – A gallon of milk, seven glasses of water, and a jar of pickle juice one afternoon? I was always thirsty. Frequent Urination – My teachers told me to stop raising my hand and “just go”. Hey, free hall pass. I’ll take it. Dry Skin – I kept a small bottle of Clinique moisturizer in my pocket and slathered my face all the time. There was a dry patch that wouldn’t go away, no matter what I did to it. Fatigue – Once a kid who bounced everywhere, I had begun napping after school. And on weekends. And on the bus. Unexplained Weight Loss – 12 1/2 years old. 64 pounds at diagnosis. I looked gaunt. Excessive Hunger – A yogurt and crackers for snack? No more. Clear the refrigerator. I checked them all off in my head, but because I had no idea how serious and deadly untreated diabetes can be, I didn’t tell anyone. I assumed that it was something that was no big deal. It’s a huge deal. I consider myself lucky. My blood glucose level was in the 400s when I was finally diagnosed. I was coherent and upright and able to function. I have met others whose families wondered if their children would ever wake up from a diabetic ketoacidosis coma in the ICU. If you have any of these symptoms (Type 1 or Type 2) or if a friend or a family member has mentioned any of them in casual conversation, or if you’ve noticed any of these symptoms in someone you care about, please get them to a medical professional for testing and possible diagnosis as soon as possible. You can help save a life. Great post! I had all the symptoms of a type 1 and even the wounds not healing quickly and yeast infections that you have listed under type 2. 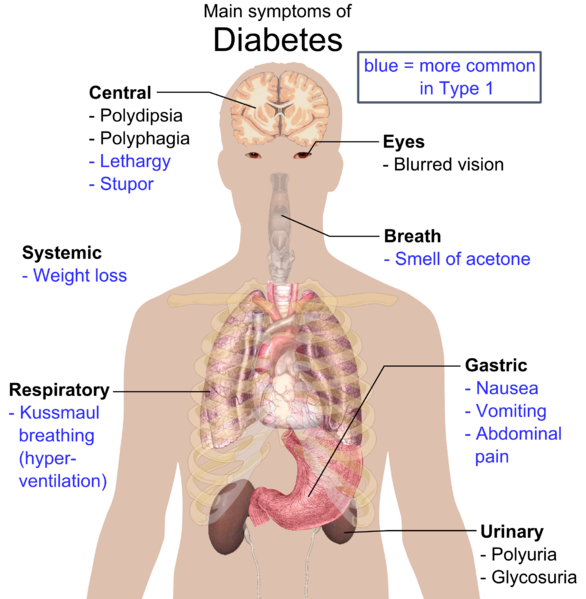 So for anyone else that may have those as well as some of the type 1 symptoms that could be a sign of type 1 as well. At 22, I had every symptom on both Type 1 lists except for unconsciousness and the doctor didn’t even identify my diabetes until my urine pregnancy test showed sky high glucose and ketones! Thank you for sharing the symptoms. I fear that people without a close connection to diabetes don’t notice them.